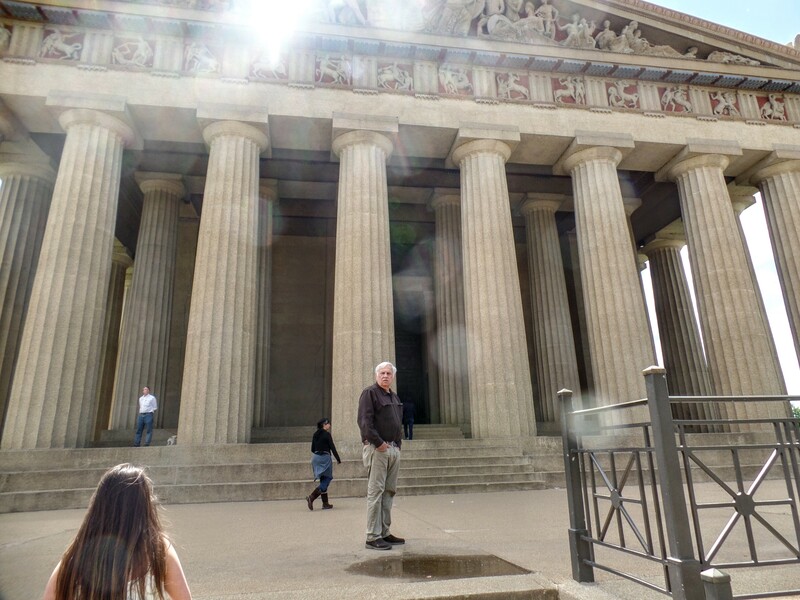 Parthenon – Let's Go RVing! A travel day – we got up about 6:30 but for some reason it takes us a while to get it together. I guess because we don’t have to hurry we don’t. We had our coffee and breakfast, then got dressed and started breaking camp. I walked over to talk with Cheryl to thank her for including us in their dinner plans last night. We said our good-byes and headed out about 9:00. We stopped at Sam’s in Bowling Green for about 30 minutes and then headed on to Nashville. The roads changed significantly when we entered Tennessee, not nearly as good as Kentucky. Traffic was pretty heavy as we neared Nashville so it was after 11:00 before we got to the campground. It’s a Passport campground so we camped a little cheaper this time. We got some lunch and then I tried to pay a couple of bills, one for Lowe’s for us and one for Mom. I spent nearly an hour trying to get that accomplished. Before we take another extended trip I will definitely look into Verizon. US Cellular just isn’t measuring up. We finally left to ride into Nashville not really knowing where we were going. We discussed going to the Hermitage but since it was after 3:00 we thought it was too late – well, it wasn’t because it was only a little after 2:00. Time changes are great for confusion. We finally ended up at the Parthenon and wow, it’s impressive. Took several pictures but unfortunately I can’t find where I put the SD card holder so can’t transfer them. After dinner tonight we were already cleaning our cabinets and we’ve only had the coach two months! We were going to take yet another trip to the grocery store tonight but it got dark and although the GPS said it was only two miles away (a Piggly Wiggly at that) we decided that it was difficult enough to get around in the day so we didn’t need to be wandering around in the dark. What a day – going to bed!